The Japanese Army fought desperately along New Guinea’s Driniumor River. Under a midnight moon, hundreds of soldiers crept forward into position along the riverbank. Fields of tall reeds helped conceal them from observation but could not muffle the sounds of weary men slipping in the mud. Sergeants whispered orders to stay quiet while officers anxiously listened for any sign the enemy was alert to their presence. As they waited for the signal to attack, the men of Major Moritoshi Kawahigashi’s 1st Battalion, 78th Infantry Regiment felt something beside fear in their stomachs. Gnawing, incessant hunger pains tormented them fiercely. For weeks they had been reduced to eating grass and insects while making a grueling march across the rainforests and swamps of New Guinea. Supplies, what few remained, could not keep up. Only through sheer willpower and iron discipline did Kawahigashi’s troops manage to get this far—but would their warrior spirit be enough to defeat the powerful American army arrayed against them? One man crouching along the banks of the Driniumor River that night believed so. He was Lt. Gen. Hatazo Adachi, commander of the Japanese 18th Army and author of this desperate plan. During the spring of 1944, massive Allied “leapfrog” invasions across the coast of northern New Guinea had cut Adachi’s command off from the rest of Japan’s Southern Army. Effectively abandoned by Imperial General Headquarters, the 55,000 men of 18th Army were left to fend for themselves without hope of resupply, reinforcement, or evacuation. 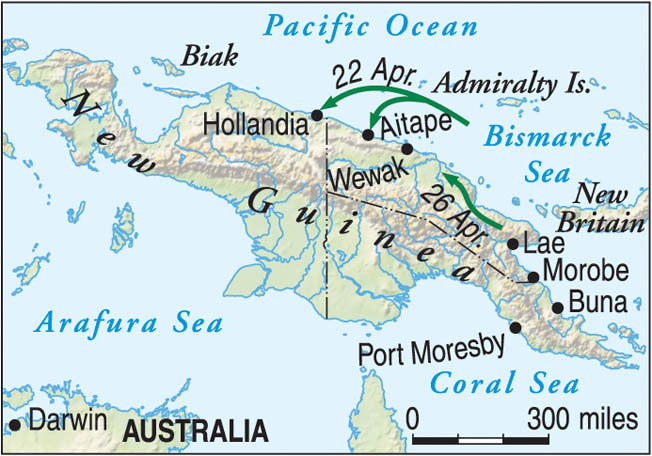 On April 22, 1944, the Americans made simultaneous amphibious landings at Hollandia and Aitape in northern New Guinea. From his headquarters at Wewak, General Adachi considered all possible responses to this menace. He could do nothing and watch his soldiers slowly die of starvation and disease. He could attack the foe at Aitape, 94 miles distant. Or he might, by an arduous walk, bypass Allied lodgments and rejoin Japanese forces stationed far to the west. None of these options appealed to the 61-year-old Army commander. Staying put in Wewak violated every principle of the Bushido (warrior) code to which he dedicated his life. Maneuvering around Aitape and Hollandia to reach friendly forces meant sending the 18th Army on a 600-mile trek through uncharted jungle terrain without adequate rations, transportation, or medical supplies. Adachi knew his men, many of whom were weakened from previous withdrawals across eastern New Guinea, simply could not accomplish such a journey. Adachi’s sole remaining course of action, then, was to attack. He had on hand two months of supplies, enough to send his strongest infantry formations against the Allies’ airfields at Aitape. If successful, 18th Army could then reprovision itself with captured matériel before moving on to take Hollandia, another 120 miles to the west. This scheme placed greater reliance on the Japanese soldier’s fighting spirit than it did on sound military strategy, which indeed was a reflection of the general who devised it. Hatazo Adachi, son of an Army officer, was born in Tokyo on June 17, 1890. Raised in the samurai tradition, the tall, heavy-set youth seemed destined to follow his father’s career path as a professional soldier. Following attendance at Tokyo Cadet Academy, Adachi joined the elite Imperial Guards Division as a lieutenant in 1910. American soldiers of the 32nd Infantry Division slog through a river while on patrol in the Aitape region of New Guinea. American offensive action cut off a sizable Japanese force, and the fight at the Driniumor River ensued. Peacetime duty emphasized the values of stoicism, self-sacrifice, and physical toughness that already were essential elements of this young officer’s character. Combat service in Manchuria and China during the 1930s earned Adachi—by now a colonel and regimental commander—a reputation for bravery under fire. He usually could be found where the fighting was heaviest, leading from the front while shunning those privileges normally due officers of his rank and status. He endured the hazards of battle as well, in 1937 taking mortar fragments to his face, neck, and leg that left him with a permanent limp. Promotion came steadily, and by 1940 Adachi wore the rank insignia of a lieutenant general. He successfully led the 37th Division in action before becoming chief of staff, South China Area Army, during the autumn of 1941. One year later he left China to command the newly formed 18th Army, then organizing on the island of New Guinea. Upon his arrival there in January 1943, Adachi encountered for the first time a shameful reality: Japanese forces defeated on the battlefield. Enemy troops had recently seized the key port town of Buna in a brutal fight, after which the remnants of its garrison fled westward, discarding along the way most of their equipment and wounded comrades. The tides of war were turning against Lt. Gen. Adachi and his command. He now faced the near impossible task of defending 400 miles of coastline against a foe who increasingly dominated the skies and the sea. Reinforcements had to run a gauntlet of air and naval attacks just to reach the 18th Army’s area of operations. Eventually, though, Japanese combat power in eastern New Guinea totaled 60,000 men organized into three divisions—the 20th, 41st, and 51st. Nonetheless, these units were all far understrength. The 51st Division, for example, lost 3,000 soldiers and most of its crew-served weapons when eight of the transport vessels bringing it forward were sunk during the Battle of the Bismarck Sea in March 1943. Adachi narrowly escaped a similar fate when enemy bombs crippled the destroyer carrying him and his staff to their new headquarters location. Protecting critical airfields at Lae and Salamaua was a scratch force of 9,000 Japanese Army and Navy personnel. In June the Allies struck, putting ashore Australian and American infantry forces that threatened to trap the defenders between two rapidly advancing assault columns. Ordered to retreat overland across the forbidding Saruwaged Mountains, those men healthy enough to walk drew 10 days’ rations and began an epic march toward safety. Malaria savaged their ranks, as did starvation and exposure. No one expected the Saruwageds to remain snow covered in July. Of the 8,600 troops who started this month-long odyssey, 2,200 did not live to complete it. The Lae-Salamaua garrison’s jungle ordeal opened many eyes to the challenges of waging war in this part of the world. Covering 488,244 square miles, New Guinea is the world’s second largest island, and in 1943-1944 it largely remained a mystery to the outside world. Huge areas were left blank—unexplored—on Japanese maps, concealing unimaginable perils for those forced to live, fight, and die there. From five to 50 miles inland, low foothills marked the beginning of the great Owen-Stanley Range, New Guinea’s jagged mountain spine. From these heights a network of streams funneled rainwater into the ocean while carving steep valleys and wide rivers impassable except by boat or bridge. Occasional roads or footpaths connected small native villages or colonial ports scattered along the northern coast, although these trails quickly turned to mud during the rainy season. Tropical diseases endemic to New Guinea defied medical treatment. Malaria-carrying mosquitoes plagued anyone without an insect net while huge feral rats spread debilitating typhus. The tropical climate itself presented myriad problems. Daytime temperatures often exceeded 100 degrees Farenheit and were normally accompanied by suffocating humidity. Aside from issues of terrain and weather, a growing enemy presence in the skies above and seas surrounding New Guinea gave Lt. Gen. Adachi cause for concern. Throughout 1943 and early 1944, the Japanese 4th Air Army had been systematically annihilated by medium and heavy bombers of the U.S. Fifth Air Force. Roving American and Australian fighter planes, working in combination with Allied warships, likewise overwhelmed the miniscule 9th Fleet. Its remaining flotilla of cargo barges and coastal patrol craft now hugged the shore during daylight hours, emerging only after dark to transport high-priority supplies and personnel. In late September 1943, battle-hardened “Diggers” from the 7th Australian Infantry Division landed near Finschhafen on New Guinea’s Huon Peninsula. In response, Adachi ordered another fighting withdrawal. His already battered legions would again make their way west, this time to strongpoints at Madang, Hansa Bay, and Wewak. The 18th Army closed on those objectives after a three-month march, traveling mostly at night under conditions of extreme hardship. Meanwhile, the changing fortunes of war had forced Japan’s Imperial General Headquarters (IGHQ) to reevaluate its strategic position in the south. At a conference held in Tokyo on September 30, 1943, senior staff officers adjusted the Army’s primary defense line across New Guinea. Its new trace now stretched hundreds of miles behind Lt. Gen. Adachi’s command, essentially marooning his 55,000 soldiers. American soldiers crouch temporarily while on patrol through the jungles of New Guinea north of Aitape. Landings at Aitape and Hollandia gave General Douglas MacArthur confi- dence that his enemy was fixed, particularly due to decoded radio intercepts. On March 14, 1944, IGHQ transferred responsibility for 18th Army to Lt. Gen. Korechika Anami’s 2nd Area Army, headquartered in Davao, western New Guinea. Hitherto, Adachi had served under Lt. Gen. Hitoshi Imamura’s 8th Area Army on Rabaul, New Britain. This command change took place when it became clear that Inamura, isolated by advancing Allied forces, could no longer exert effective control over the 18th Army’s operations. In truth, IGHQ did not possess a viable strategy for the defense of New Guinea. None of the officers in Japan’s high command could determine how to stop their enemy’s inexorable advance with the meager assets then available. What followed in the spring of 1944 was a series of contradictory orders from Tokyo to General Anami in Davao, instructing Adachi’s command to hold decisive terrain along New Guinea’s northeastern coastline while simultaneously withdrawing all major combat elements westward toward the primary defense line. These dispatches often dictated troop movements down to the smallest detail while remaining utterly oblivious to the realities of marching and fighting in New Guinea. After receiving one message requiring 18th Army to complete the 215-mile walk to Hollandia in an impossibly short span of time, a frustrated General Anami complained to his diary that “the Imperial General Headquarters is disordered like hempstrands!” Yet, while he privately protested Tokyo’s impractical directives, the 2nd Area Army commander dutifully transmitted them to Lt. Gen. Adachi for execution. Thirteen hundred miles to the east, however, the 18th Army commander saw things quite differently. As March turned to April, Japanese patrols began reporting signs of an imminent Allied invasion of Wewak. Rubber rafts, indicating the presence of seaborne reconnaissance teams, were discovered on nearby beaches while enemy aircraft filled the skies overhead in ever growing numbers. Lt. Gen. Adachi decided to disobey orders and defend the Wewak-Hansa Bay region, keeping his superiors informed by the only means left to him: radio. Unknown to the Japanese, enemy cryptanalysts were reading every wireless message sent to or received by 18th Army. Thanks to Ultra, his top secret signals intelligence source, U.S. Army General Douglas MacArthur, supreme commander of Allied forces in the Southwest Pacific Area, knew his deception plan was working. Adachi had taken the bait—those inflatable dinghies left on likely beachheads—and was sitting tight at Wewak. MacArthur also had in hand the approximate location and strength of every Japanese unit on New Guinea, information he soon used to his advantage. In a series of daring amphibious operations, American combat troops stormed ashore near the lightly defended airfields at Hollandia and Aitape on April 22, 1944. The Allies took a calculated risk by landing between a still formidable 18th Army and the rest of Anami’s 2nd Area Army in western New Guinea, but MacArthur felt sure his radio interception teams would provide warning of Adachi’s intentions in time for U.S. forces to meet and destroy this threat. 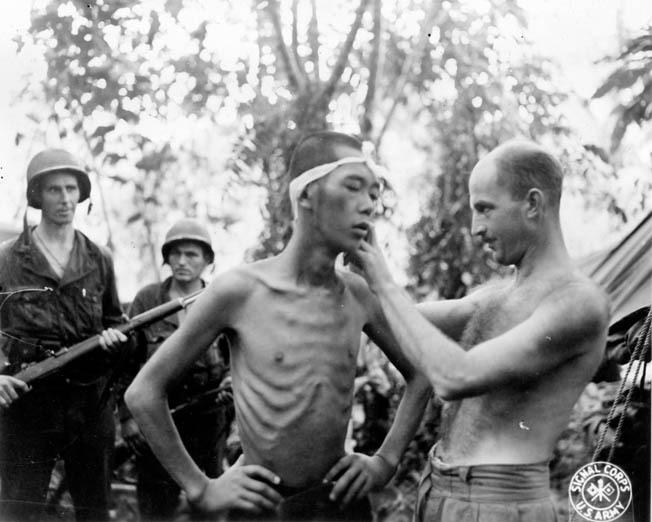 An emaciated Japanese prisoner, one of the lucky Japanese soldiers captured alive in the campaign that culminated with the battle at the Driniumor River, is examined by a medical officer of the 32nd Infantry Division. The Japanese commanders on New Guinea also wanted to attack. Both Lt. Gen. Adachi at Wewak and his superior, Anami (who on April 25 moved his headquarters from Davao to Menado in the Celebes) believed they possessed the means to vanquish those Allied lodgments at Aitape and Hollandia. Their plan did not fit into IGHQ’s way of thinking, however, and on May 2 Tokyo directed another strategic withdrawal deeper into the Vogelkop Peninsula of New Guinea. The 18th Army was again ordered to move westward and join Anami’s forces defending the Vogelkop. On May 27, the Americans invaded Biak, severing all lines of communication between 2nd Area Army and Lt. Gen. Adachi’s command. Acknowledging that nothing more could be done to help 18th Army, IGHQ on June 20 subordinated that formation directly to the Southern Army Headquarters in Singapore. Tokyo’s final instructions were to “simply carry out general holding operations to sustain key areas in the region.” In other words, Adachi and his men were on their own. A lifetime of service had taught Hatazo Adachi to think as well as to obey. Indeed, he was obliged by military tradition to demonstrate initiative even if it meant ignoring orders. And like all Japanese fighting men, Lt. Gen. Adachi had sworn he would die if necessary in the defense of his emperor and homeland. “We desire life. We desire honor,” he wrote in May. “If we cannot have both, we should discard life and cling to honor.” His choice was clear: 18th Army would attack and die with honor. On May 5, Adachi outlined for his officers the plan to take Aitape, codenamed Operation A. Five days later several long-range reconnaissance platoons set off on foot to scout the American positions and report back their findings. At about the same time, soldiers of the 20th and 41st Divisions started moving from Madang and Hansa Bay to consolidate on the 18th Army’s base at Wewak. These were Adachi’s most battleworthy commands, numbering perhaps 5,000 riflemen between them, but they also had the farthest to march. Madang sits 200 trail miles from Wewak. The 51st Division, except for one regiment, was kept back as Adachi’s rear guard to delay Australian forces gradually pushing west from Sio. An additional 3,000 convalescents stayed behind in the hospital, while large numbers of healthy soldiers—as many as six men for every combatant on the front line—were detailed to serve as porters hauling ammunition, rations, and even mountain artillery pieces. Altogether, approximately 35,000 Japanese troops set out for Aitape during May and June of 1944. Adachi’s campaign suffered a serious setback on May 10 when the landing barge carrying Lt. Gen. Shigeru Katagiri, commander of the 20th Division, hit an Allied sea mine off Wewak. The explosion killed Katagiri and his entire staff. Another crisis occurred shortly thereafter when six senior officers from the 41st Division died in an enemy air strike. The loss of these experienced leaders would be felt acutely before long. As was his custom, Lt. Gen. Adachi accompanied the main body of troops marching on Aitape. Remaining in Wewak was his able chief of staff, Lt. Gen. Kane Yoshihara. It was Yoshihara’s mammoth task to keep the 18th Army supplied during its attack. Every round of ammunition and morsel of food was borne on the backs of Yoshihara’s men. It was not enough. Survivors of the 3rd Battalion, 80th Infantry Regiment recalled their daily allocation of rice amounted to less than 12 ounces, with biscuits appearing once every two or three days. Three precious cigarettes were allotted each man every 10 days. Many troops supplemented their meager rations by eating sago palm leaves, but as the dirty, exhausted columns of Japanese made their way west malnutrition started to set in. Adachi initially directed his columns to make eight miles per night, a realistic objective given New Guinea’s harsh conditions. Soon, though, that figure was reduced by half. Countless stragglers shuffled behind every marching unit while the flow of provisions slowed to a trickle. Sorely needed salt and medicines were simply unavailable, making this jungle trek a living nightmare for those forced to endure it. Deepening everyone’s misery, the skies then opened up in a summer-long deluge of rainfall. 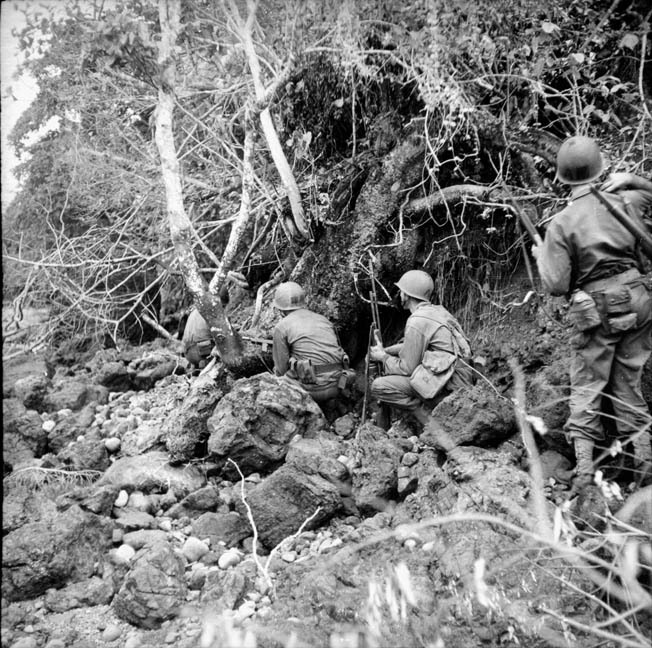 A combination of Japanese fighting spirit and the promise of captured American rations at Aitape helped drive the troops forward. The sight of their commanding general sharing every hardship with his men provided additional motivation. Few realized that Adachi was suffering from an excruciating hernia; hiding his pain behind a mask of stoic indifference, he walked on. The soldiers moved by night as prowling enemy aircraft made daytime travel too hazardous. At dawn they would attempt to rest in the stifling rainforest, eating what food was available and dreaming of the feast that awaited them once their adversary was defeated. And each morning Lt. Gen. Adachi dutifully reported his progress by radio—every word of which was noted by Allied codebreakers. Thus MacArthur knew exactly where Adachi’s march columns were, as well as their attack plans. While Australian signal intercept teams tracked the Japanese troops’ laborious slog across New Guinea, the Americans holding Aitape prepared to receive 18th Army’s onslaught. Facing Adachi’s men were the soldiers of Task Force Persecution, commanded by U.S. Army Maj. Gen. William H. Gill of the 32nd Infantry Division. The majority of Gill’s defenses were arrayed in a semicircle around the airfields at Tadji, eight miles east of Aitape. However, to provide early warning of the anticipated Japanese offensive, Gill sent a covering force 15 miles farther east to the banks of the Driniumor River. This formation, commanded by Brig. Gen. Clarence A. Martin, consisted of 3,500 riflemen backed up by artillery, armor, PT boats, and close air support provided by Bristol Beaufort bombers of the Royal Australian Air Force’s No. 71 Wing. 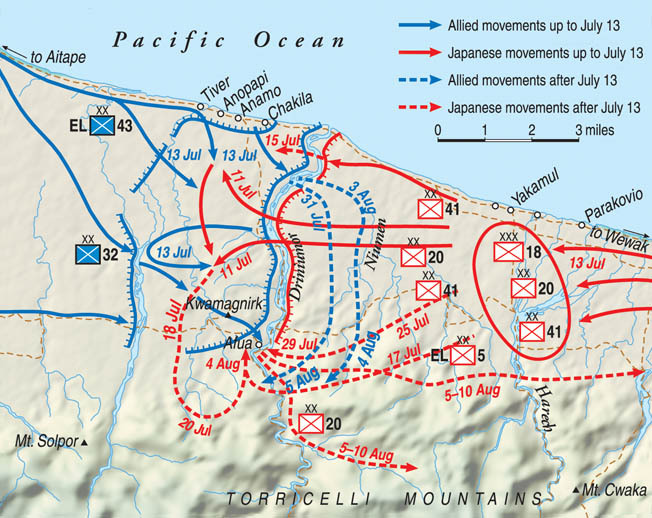 First contact between the two opponents occurred on May 22 when advance elements of Adachi’s 20th Division surprised and nearly cut off an American reconnaissance patrol operating near the coastal village of Nyaparake. A larger clash took place in early June when riflemen of the 78th and 80th Infantry Regiments fell on an entire U.S. battalion at Yakamul, three miles west of Nyaparake. 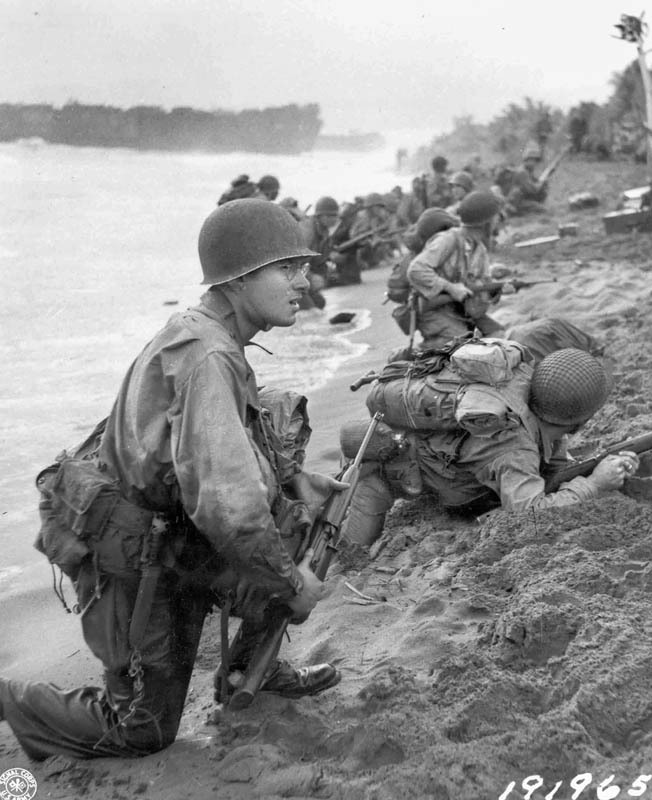 Closing in for the kill, Japanese soldiers watched with frustration on the morning of June 5 as Allied landing craft arrived to rescue the last company of GIs trapped on the beach. By now, Generals Gill and Martin no longer doubted that Adachi was coming. Japanese operations orders captured later in June further convinced them of this, but still in question was the assault’s time and location. Enemy ground patrols could not penetrate 18th Army’s tough counterreconnaissance screen, while misread Ultra intercepts lulled Allied commanders into a false sense of complacency. 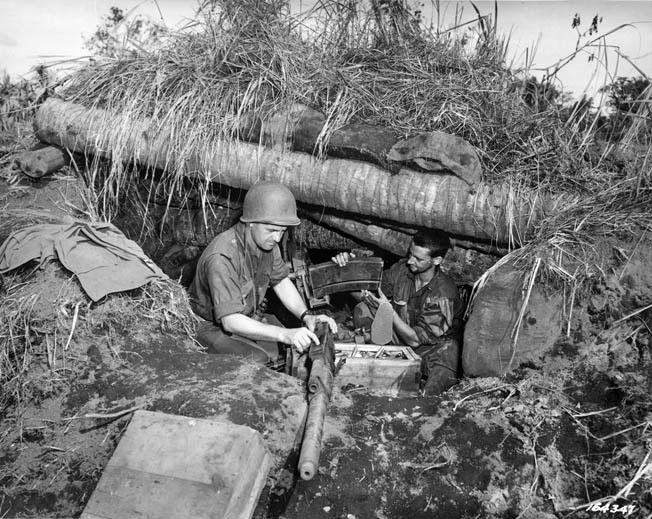 Soldiers of the 32nd Infantry Division maintain their machine gun from a reinforced position in the New Guinea jungle. American firepower and supply gave them a decided advantage in the upcoming fight at the Driniumor River. MacArthur’s intelligence staff thought the 18th Army would attack on or about June 15, but once this date passed quietly many U.S. officers figured the Japanese had already started retreating back to Wewak. Another predicted assault on June 27 never materialized, and by the first of July American troops had lost all contact with Adachi’s forces along the Driniumor line. Mysteriously, his radio also fell silent—much to the annoyance of Allied Ultra intercept teams. Yet there were 20,000 Japanese fighting men massing for battle in the trackless jungle east of the Driniumor River. Supply problems, delayed troop movements, and his soldiers’ growing exhaustion caused Lt. Gen. Adachi to postpone the offensive several times, but by the second week of July he felt ready to strike. No longer needing a radio to communicate with his subordinates, the commanding general delivered his final attack orders personally, often within yards of the Americans’ earthworks. His plan called for a direct frontal assault to commence on the night of July 10-11. After a 10-minute artillery preparation, three regiments of infantry would cross the Driniumor at midnight, overpower the American defenses there, and reorganize before continuing their thrust against Task Force Persecution’s main line of resistance surrounding the airfields at Tadji. A supporting attack along the coast was intended to eliminate U.S. artillery emplacements spotted near the mouth of the river. Elements of both the 20th Division, commanded by Maj. Gen. Masutaro Nakai, and the 41st Division, under Lt. Gen. Goro Mano, would make the assault. The 237th Infantry Regiment of Mano’s 41st Division, just then arriving on the Driniumor and led by Colonel Masahiko Nara, was designated to make Adachi’s main effort. Advancing to Nara’s left were the 20th Division’s 80th and 78th Infantry Regiments, commanded by Colonels Tokutaro Ide and Matsujiro Matsumoto, respectively. The Coastal Attack Force was led by Major Iwataro Hoshino of the 41st Mountain Artillery Regiment. Members of the 51st Division’s 66th Infantry Regiment acted as Army reserve. The Driniumor River, over which Adachi’s troops would cross, had its headwaters high in the Torricelli Mountains. At a collection of native huts known as Afua it bent north toward the coast, six miles distant. Here the river’s current grew sluggish while its water ran no higher than waist deep. The riverbed averaged 100 yards in width, with tall reeds replacing the normal jungle understory on both sides. Several small islands, the most prominent of which was labeled “Kawanaka Shima” (Middle of the River Island) on Japanese maps, served to orient the attackers on their objective. General Adachi understood much about his opponents but still lacked some critical information. Recently, American infantrymen had erected barbed wire obstacles in front of their fighting positions and registered likely targets for artillery. The enemy had also been reinforced—now there were five battalions (three infantry, two dismounted cavalry) dug in on the Driniumor front, with a full 3,000-man regiment in reserve nearby. The Japanese could not know that Maj. Gen. Gill had recently been replaced as head of Task Force Persecution by Maj. Gen. Charles P. Hall, commander of the U.S. XI Corps. Bending to pressure from an impatient General MacArthur, Hall resolved to smash the 18th Army rather than let Adachi’s men destroy themselves on his defensive lines. On July 10, 1944, he dispatched two battalion-sized patrols from the Persecution Covering Force—one striking out from the south near Afua, another moving along the Pacific coast—to find this phantom army, defeat it, and free up Allied soldiers needed for the impending Philippines campaign. The grueling march undertaken by Japanese troops under General Hatazo Adachi ended in defeat at the Driniumor River. The Japanese made some initial gains at heavy cost, but American counterattacks decimated their ranks. Hall’s timing could not have been worse. In the impenetrable rainforest both of his patrols completely missed 18th Army, then making final preparations for its own assault that very evening. Inexplicably, Hall took these two battalions off the Driniumor line rather than out of his reserve, thus stripping away much of the Persecution Covering Force’s combat power at a time when it was most needed. Last-minute problems also bedeviled Adachi’s attack columns. Colonel Nara’s 237th Infantry, the 18th Army’s strongest unit, showed up late and failed to conduct vital pre-battle reconnaissance. In the 20th Division’s zone, elements of the 78th and 80th Infantry Regiments became hopelessly intermixed. No time remained for officers to sort things out before the assault commenced. At 2350 hours on July 10, stunned GIs of the 2nd Battalion, 128th Infantry Regiment were driven deep into their foxholes by an unexpected barrage of artillery fire. Mortars and machine guns continued to suppress the Americans. Then as parachute flares lit the sky thousands of Japanese soldiers rose up and began running forward. Starting off five minutes too early, the 400 troops of Major Moritoshi Kawahigashi’s 1st Battalion, 78th Infantry Regiment initiated Adachi’s attack. Just before midnight they rushed for the river, making it halfway across before incoming American artillery began to fall among them. Well-sited enemy automatic weapons also lashed the Japanese, whose assault stalled in midstream. Within minutes all but 90 of Kawahigashi’s soldiers were left dead or wounded along the banks of the Driniumor. On Kawahigashi’s right flank, another group of riflemen surged through the reeds. This was the 1st Battalion, 237th Infantry, commanded by Major Shigemichi Yamashita—8th Army’s main effort. In the chaos one company mistakenly strayed onto Kawanaka Shima and was wiped out by American small-arms fire. The remainder of 1st Battalion pressed into a growing avalanche of cannon, mortar, and grenade explosions. Torrents of lethal metal fragments ripped into Yamashita’s troops, stopping their attack cold. Then the enemy howitzers shifted their fire onto other targets, leaving behind an eerily silent battleground. But Adachi’s second echelon was now making its appearance. American defenders watched in horror as hundreds more Japanese fighting men emerged from the murk, stepping over the bodies of their comrades in a frantic dash onward. Their battle cries mixed with screams of pain, officers’ orders, and heavy gunfire to form an ear-splitting cacophony of sound. 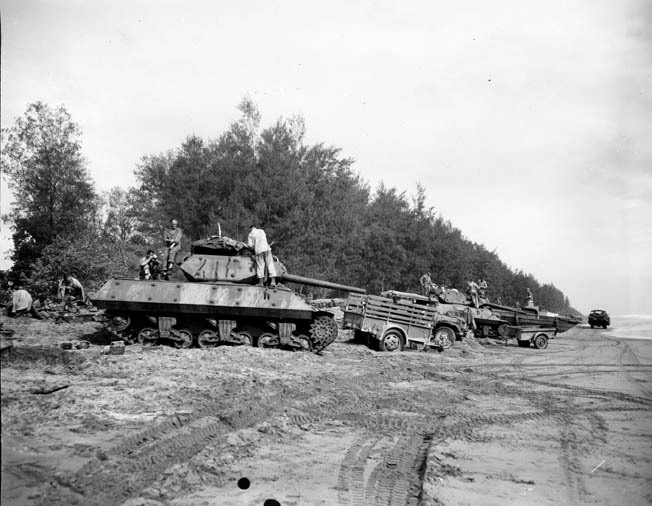 An American tank destroyer and other vehicles attached to the 32nd Infantry Division are readied for an advance against Japanese positions. Smoke and dust raised by both sides’ bombardment obscured barbed wire entanglements put in place to protect the GIs’ foxholes. Many Japanese infantrymen died trying to clear these obstacles, but soon the weight of their numbers began to tell. American machine guns fell silent from lack of ammunition while artillery and mortars could no longer fire for fear of hitting their own people. To the north, Company E of the U.S. 128th Infantry was overrun. Adachi’s men had broken through. A follow-on assault commencing at 0500 hours further consolidated 18th Army’s hold along the Driniumor. By dawn on July 11, it became clear the attackers had torn a 2,000-yard hole in their enemy’s lines while forcing the Persecution Covering Force, including its two battalions sent out earlier on patrol missions, to hurriedly withdraw some three miles to the west. Left behind for the rejoicing Japanese were huge stocks of equipment, supplies, and rations. General Adachi had achieved his first objective, albeit at a cost of more than 800 killed or wounded. Worse, those men who did make it across the Driniumor were badly scattered and disorganized. Many officers perished in the fray, while others such as Colonel Nara of the 237th Infantry got lost and did not reappear until sometimes days later. Allied howitzers and fighter bombers continually harassed the crossing sites and likely troop concentration points. Still, the mood in Adachi’s command post was one of cautious optimism. Major Hoshino’s Coastal Attack Force reported ambushing a U.S. counterthrust at dawn on July 13; along with inflicting numerous casualties Hoshino claimed to have wrecked two tanks. Japanese reinforcements poured west across the Driniumor while reconnaissance patrols sent word back that the Americans were still in full retreat. fantry battalions and two cavalry squadrons then regrouping plus Allied naval vessels, aircraft, and field artillery in support, Hall and Gill were already coordinating plans for a counterattack. The Americans intended to regain the Driniumor, quickly seal the breach in their lines, and then crush 18th Army. First to feel the foe’s wrath was Major Hoshino. Late on July 13, his soldiers were pummeled by a rolling artillery barrage under which riflemen of the 1st Battalion, 128th Infantry Regiment advanced. Their assault was backed by M10 tank destroyers on the beach along with rocket-firing LCMs (Landing Craft, Mechanized) offshore. By nightfall the remnants of Hoshino’s Coastal Attack Force had been cut off and rendered helpless by overwhelming Allied firepower. With the mouth of the Driniumor once again in American hands, the 1/128th Infantry next turned south. Their objective was to link up with GIs of the 112th Cavalry, who were pushing north from their base at Afua six miles upstream. In between were thousands of Japanese fighting men, low on ammunition but flush with the heady confidence of victory. Their bellies were full of captured C-rations, and for once their skin felt dry under U.S. ponchos. Lieutenant General Adachi took time on July 14 to reorganize his army. Acknowledging the severe losses suffered by his 78th and 80th Infantry Regiments, Adachi consolidated them into one formation under the command of Maj. Gen. Sadahiro Miyake of the 20th Division. This so-called “Miyake Force” then seized a jungle ridge northwest of Afua, directly in the path of the advancing American 112th Cavalry Regiment. Both sides wanted Afua, lynchpin of the Driniumor River line. For nearly one month the 18th Army and a growing American combat team organized around the 112th Cavalry grappled for possession of this backcountry crossroads. Afua’s 10 native huts, pounded flat by constant bombardment, changed hands at least six times throughout the remainder of July and early August. All the while Miyake Force kept losing soldiers to disease, enemy ambushes, and sheer exhaustion. By the end of July, though, both Lt. Gen. Adachi and his American opponents were eager to stage one last decisive clash for control of the Aitape region. For 18th Army this operation would be “literally a fight to the death,” as Lt. Gen. Yoshihara wrote later. Adachi’s men were running out of everything—absent ammunition they could not fight and lacking food they could not live. The Japanese were also running out of time. Maj. Gen. Hall now had powerful elements of three U.S. infantry divisions and a cavalry regiment on the ground at Aitape, outnumbering his adversary almost four to one. On July 31, Hall sent four rifle battalions from the mouth of the Driniumor River to sweep around 18th Army and envelop Adachi’s forces from the rear. The weakened 41st Division, guarding those approaches, could do little to stop them. 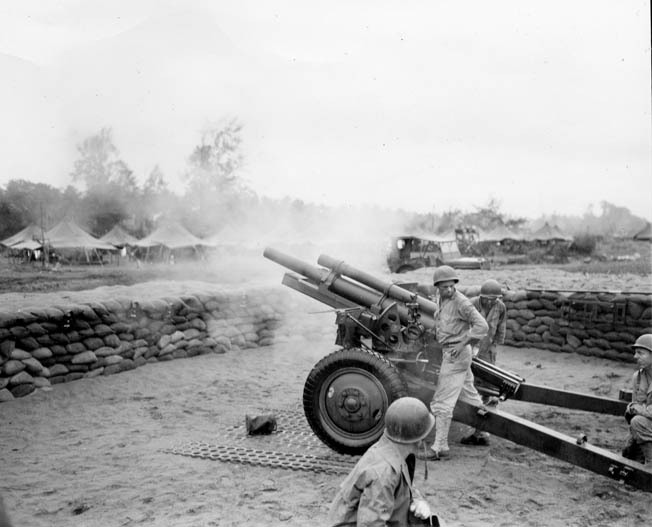 American artillerymen of the 152nd Field Artillery Battalion fire a 105mm howitzer at Japanese positions near Aitape. The prolonged days of fighting at the Driniumor River took their toll on both sides, but in the end the Japanese were decimated. The climactic battle for Afua commenced on August 1. Firing all remaining ammunition, Japanese artillerymen plastered enemy fortifications while riflemen of the 66th Infantry Regiment positioned themselves for a desperate attempt on the Americans’ flank. The 66th was Adachi’s last reserve, and together with remnants of the 20th and 41st Divisions these soldiers charged across the Driniumor one final time that morning. Three weeks of ceaseless shelling and rainfall had turned the battlefield into a perfect quagmire of shattered trees, impact craters, and knee-deep mud. Slowed by unforgiving terrain and ferocious enemy fire, the attackers accomplished little while taking heavy casualties. By nightfall it was all over. Lt. Gen. Adachi reluctantly ordered the starving survivors of his once proud 18th Army to begin their tortuous retreat toward Wewak. While the Japanese conducted several small assaults over the next few days, these actions served chiefly to cover the main force’s withdrawal. Afterward, GIs patrolling along the Driniumor River were appalled by the destruction wrought there over the past 25 days. One member of the 112th Cavalry recalled thinking the waterway was full of logs. Looking again, he realized those “logs” were actually hundreds of Japanese corpses. Indeed, Adachi’s legions had been bled white during this campaign. Almost 10,000 of his men were reported killed or missing, although an exact reckoning of Japanese casualties may never be made. Unsurprisingly, most battle deaths occurred within 18th Army’s infantry formations. The 78th Regiment, for instance, entered battle with 1,300 effectives and emerged with 350—73 percent of its combat strength was lost in action. Other units listed similar figures. Task Force Persecution recorded its losses as 440 killed, 2,550 wounded, and 10 missing. For several weeks U.S. patrols followed the Japanese back toward Wewak, fighting several sharp but minor engagements with Adachi’s rear guard. Maj. Gen. Hall declared the Aitape operation concluded on August 25. The 18th Army’s ordeal, however, continued on. In May 1945, the Australian 6th Division captured Wewak, forcing its garrison to retreat far into the mountains where they remained until the end of the war. Of the estimated 150,000 Japanese soldiers who fought with Adachi on New Guinea, a mere 13,000 survived to follow their commanding general into captivity. Hatazo Adachi went on trial as a war criminal for atrocities committed by his men against Allied prisoners and civilians on New Guinea during World War II. Convicted, he received a life sentence but committed ritual suicide with a paring knife on September 10, 1947. Like so many of those he led in battle, Adachi never returned home—his mortal remains now “a clod of earth” in some long-forgotten Pacific gravesite. Frequent contributor Patrick J. Chaisson is a retired U.S. Army officer who writes from his home in Scotia, New York. Tags alles, Allied Commanders, Allies, American, artillery, Australia, Battle of the Bismarck Sea, battlefield, Biak, Bismarck, Boxing, Britain, C-ration, cannon, cavalry, China, CIA, cod, Codebreakers, Company E, Destroyers, EAM, earthworks, Fifth Air Force, general, General Douglas MacArthur, GRU, Holland, Hollandia, Howitzer, Japan, Japanese, Japanese Army, Knife, Lae, machine gun, Manchu, Manchuria, Mary, military, military strategy, Mortar, navy, New Britain, New Guinea, New Guinea Campaign, New York, NSA, OSS, Pacific, PC, Philippines, Philippines Campaign, POW, rabaul, Rome, Samurai, singapore, Southwest Pacific Area, Squad, Tanks, Tern, The Pacific, Thor, To Die with Honor, Tokyo, Top Secret, Tory, Troy, ULTRA, US Army, weapons, WIN, World War I, wounded, WWII History April 2017 issue, XI Corps.